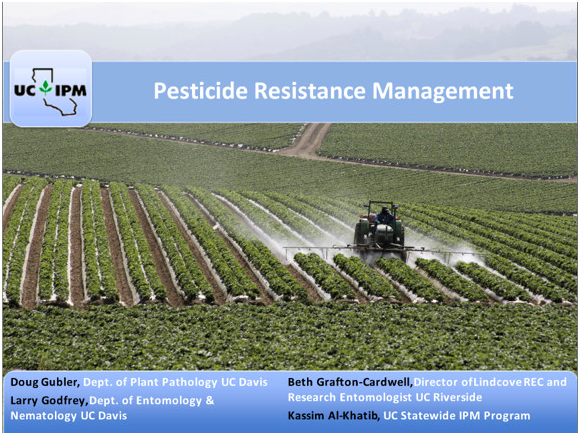 An online course highlighting how pesticide resistance develops among pests is now available on the UC IPM web site. Created primarily for pest control advisors and other licensed pesticide applicators, this course describes the mechanisms of resistance in pathogens, insects, and weeds and discusses ways to manage resistance within the different disciplines. The online course is divided into three narrated presentations followed by a final test for each section. This course has been approved for 2 continuing education units in the “Other” category from the Department of Pesticide Regulation. This course is based on a series of workshops held in Davis, Fresno, and at the Kearney Agricultural Research and Extension Center during the spring of 2014 presented by Dr. Doug Gubler (Dept. of Plant Pathology, UC Davis. ), Dr. Larry Godfrey (Dept. of Entomology and Nematology, UC Davis), Dr. Beth Grafton-Cardwell (Lindcove Research and Extension Center and UC Riverside), and Dr. Kassim All-Khatib (UC Statewide IPM Program). Check out the new course at http://www.ipm.ucanr.edu/training/pesticide_resistance.html.